Okay, are you ready for this bold, bright combo this week at the Play Date Cafe? It's Teal, Electric Green, Tangerine, and Jeans. And yes, that is a neon shade in the line up! So glad I had some DeNami buttons on hand in those neon shades. Whew! 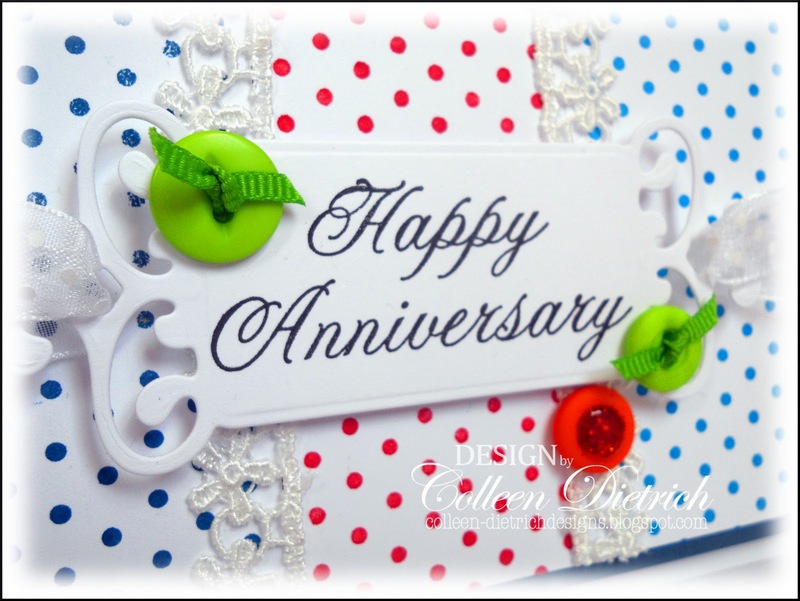 Our sponsor this week is DRS Designs, and our DT was blessed with two stamps of our choice. I chose the Polka Dot background and the gorgeous script sentiment. I had a little trouble matching up colors with what I own, but wound up using these on the polka dots: Not Quite Navy ink, Ocean Chalk Ink, and Poppy Parade marker. See the orange button? It's from DeNami. I added some glue in the middle, and sprinkled with glitter. (should have stopped there) When it was dry, I added a topping of Crystal Effects. Unfortunately, it didn't dry clear, so I didn't take TOO close of a shot, 'cause it wasn't what I was going for. Thanks for coming by today; I love when you visit! Great showing off those crazy colors in such a cute way! I really adore how this came out! I of course love the addition of the buttons! Wow, those are some bright colors, but I think you balanced this perfectly!! That polka dot background is ultra sweet, and I love the pretty script sentiment. Lovely! Wow tough colors but you pulled it off beautifully! Those dots are great and the buttons and lace are perfect touches! Very pretty card and so is your blog banner! Less is defintely more; The polka dots; the simple but stunning desing. This is a brillian take on the challenge and a lovely example to look at! Thinking of you a LOT! And I cherish that a-m-a-z-i-n-g card! I adore polka dots! 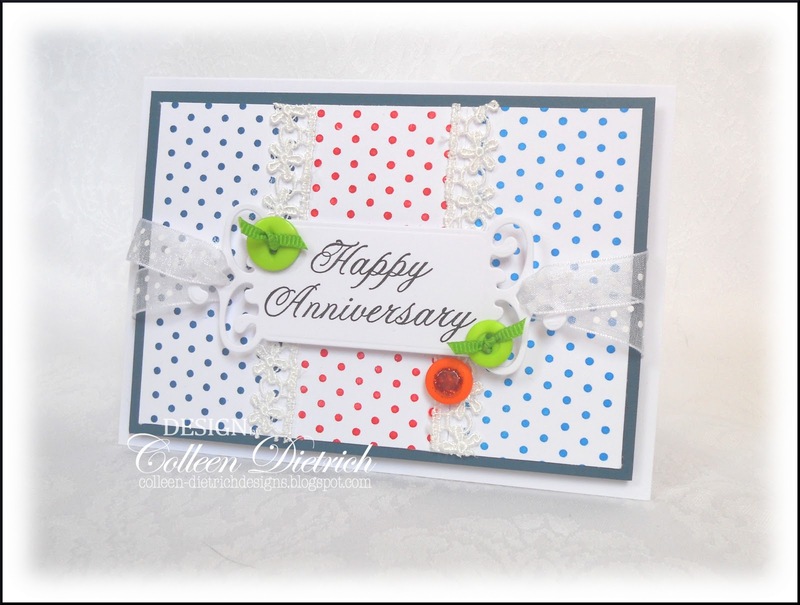 Love the sweet look of them on your card! How bright and cheerful! I love polka dots so this jumped right out at me. 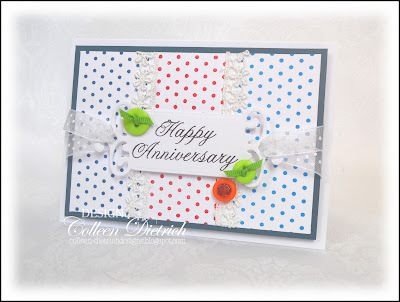 I love these bright polka dots and the simplicity of this card! One of my favorites. Colleen this is so cheery! I LOVE it! All those polka dots are just too fun, Col! LOVE the way you've divided it up with your ribbons and lace! Another beauty! Sorry, but I'm seeing all of your posts in reverse as I am WAY behind on my hopping this week. I love your polka dot paper and those colorful buttons. I never seem to think to use my stash of buttons.